Hello, I have 3 olosapo seedlings that I would like to graft, is anyone here selling any scion wood? Thanks! 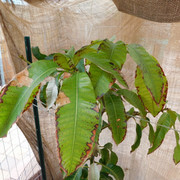 Tropical Fruit Discussion / What is happening to my mangoes? I noticed that the new growth its not pushing leaves and it seems like somethin is eating them, or the leaves are not developing and just going dark. 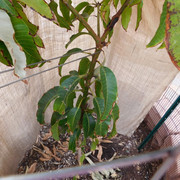 On top of that my other mango started to get brown on the leaves and a whole branch went black, so I cut it off before it reached the main trunk. I also noticed a gummy stuff coming out of the joins of the trunk. What can I do to stop this? Please help! Hi! for those of you who live in Costa Rica I am going for a week, and I will be in the area of Del estadio "Colleya Fonceca 100 mtros Oeste, in the Guadalupe area. Can anyone suggest a decent place to stay that is safe for two traveling women where we can get our food if needed it. 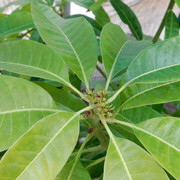 I will also like to know if there are any areas where we can go and see the tropical fruit in season. Any suggestions will be appreciated I have never been there. This question may be clear for many of you, but I haven’t found the answer yet. 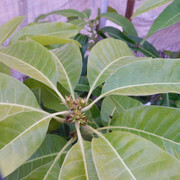 Does it matter what time of mango do I use to graft another onto it? 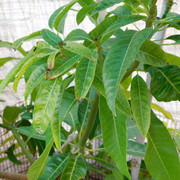 For example, if I have a manila grafted mango, can I graft Valencia Pride or Lemon Zest on it? I know that there are some variations in growth but if I want to top off the manila and just let the scion grow will it make a difference? I know that there are the Indian family of mangoes and the ones that we get form Mexico. Can those two be put together? I am just trying to figure out why some of my healthy looking grafts didn’t take on a perfectly good manila and one that was turning a bit yellow grafted on a Raposa it’s growing. Tropical Fruit Buy, Sell & Trade / Who sells Mangoes from their orchars in the forum? I will like to buy some mango fruit this year from different sellers. I ordered some from mango factory last year but, they have a limited variety of mangoes, so if you know of someone who has more mangoes that they can eat and want to sell me some please let me know. Thanks! Tropical Fruit Discussion / Apple Mango ???? 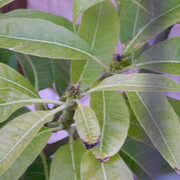 In El Salvador I used to eat "mango manzano/a" I don't know the correct name for it, all I know is that when it was green it was sweet, not sour like the other mangoes in the country, I never ate it fully ripe, but I need to know if any of you know what is the scientific name for it, and where I could buy a small tree. 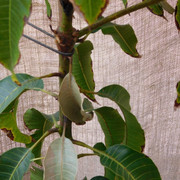 Tropical Fruit Discussion / Can I graft Olosapo scion into Mamea Sapote? Tropical Fruit Buy, Sell & Trade / Where or whom to buy Ice Cream bean fruit? I know it may be earlier in the season, for the States but I will love to know who sells and ships Ice Cream bean fruit from this forum. I grew up eating this fruit and I will love to eat it again. Thanks in advance. I am looking for seeds or a female tree. Thanks! I am getting ready to cover my plants for the winter and I want to have the right material; previously I have used Burlap from Home Depot, but they still got frost damage, so I am reaching out to you guys to see if you have a better idea of what to buy instead of burlap, and where to buy it from before I actually need it. Thanks in advance! I think this was a success! I air layered 6 branches and 4 of them took. 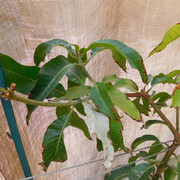 I just cut them and put them in pots today, but I would like to know if I should cut them down, each one is about 6 feet tall and have some great leaves, but now that they are planted maybe it would be too much for the new tree. Citrus General Discussion / what is the name of this citrus? Hello! I went to visit my aunt in EL Salvador and she has this orange/mandarin tree in her front yard. The fruit is very juicy and heavy producer. She said that he tree only produced about 700 fruit this year, but last year it was about 2400!. She sells then for $6.00 per 100 fruit so she keeps track. No body knows what it is other than the fruit is juicy and some fruit seem more like mandarins than oranges, others more like Valencia oranges but they all taste the same. Any help will be appreciated. Thanks! Tropical Fruit Discussion / what is the scientific name for this fruit/tree? Back in 2012 on my trip to the Dominican Republic I saw this tree, it reminded me of the same tree in El Salvador that we call ;"Aceitunas" , They come in purple and white kind of yellowish like these ones, but the fruit is sweet and I used to love to eat them when I was a child. Since they look like the Olive fruit here in the states I was wondering if it is the same family but different variety and I would love to grow those here as well. Thanks in advance! Tropical Fruit Discussion / Scion wood - How long can I keep it in the fridge? I know its not the right time, but I found some mango trees that I wanted to graft here in the US, and I managed to get some scion wood. Since I don’t have the trees available for grafting right away, I was wondering how long I can keep it in the fridge before it goes bad. I went just by the description of the mango fruit since its not mango season in El Salvador and they belong to family members; it would be a surprise to me when if I get some fruit out of them. I just want to experiment! Tropical Fruit Discussion / What kind of fruit is this? I went on vacation to El Salvador in Central America for two weeks, and I found this fruit that I had never seen before at the beach house we staying. I asked about the name and the lady there said that they call it " Aguacoco" Do any of you know what the scientific name is? I managed to get some seeds home with me, the taste was interesting but I only ate one (since I didn't know much about it) and the birds seemed to love them. Leeches, Arrayan, Jocote de corona, Mamey, Nispero, Green mangoes, Nances, Icaco, Anonas, Guanabas, apple bananas and sapotes ( That is the name I know for them) It wasn't "fruit season" so we were happy with what we got. 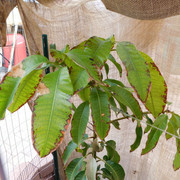 Tropical Fruit Discussion / Best place to get Jaboticaba seeds/plants shipt to AZ? This is a cry for help form the all the Jabo collectors. Hello! I was wondering if once you wrapped your air laying with the moist medium around, is it necessary to keep checking the medium to keep it moist? or do I just leave it alone and just check in a few weeks so see of it took? Tropical Fruit Buy, Sell & Trade / Where to order lychee on line? Hello! I live in Phoenix Arizona and the Lychee we get in the Asian stores here are pathetic and usually over ripe or very poor quality. Do you guys know of a reliable place that ships to AZ? Thanks! 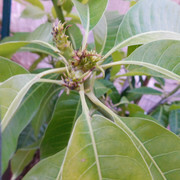 If I was to move to FL when I retire, what area of FL will be the better one to start growing tropical fruit. I am thinking a small house with an acre lot to keep me busy. I currently live in AZ, but have been to FL about 5 times and can't begin to think where to look. I have only been in Miami, Fort Myers, Sanibel Island, FL keys, FL City and Homestead FL. Mostly to visit botanical gardens and enjoy the beach. I will love for the locals to give me their input so on my next trip I can start exploring my options. Thanks in advance!